The information on this page is meant to be introductory in nature. Stronger kyu and dan players are advised to look at 4-4 point 3-3 invasion joseki instead. An overview of SL pages about the 3-3 point invasion is given on All About 33 Point Invasion. Unfortunately, the thinking on this page does not currently reflect the influence of AI play, which has led many players to reassess this invasion, and use it earlier in the opening. Many weak players fear the invasion of in this diagram. Playing Black, they have the idea that their corner territory is taken away, and are, in a sense, correct. After , it is White rather than Black who will make territory in this corner. Nevertheless, Black should welcome this invasion. Black should not see this move as an attack on Black's territory; the 4-4 point is not meant to take the corner, but emphasizes influence and quick development. 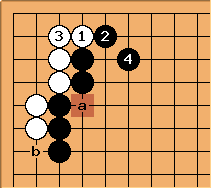 The white invasion at is separated from the rest of the board by the black stone on the 4-4 point. By playing correctly Black will get a strong position. Because of this, stronger players play only if the position on the edges is such that a white stone at a or b will come under attack. White, for his part, should resist the temptation of invading here too soon. The general principle is that White should seek to invade at the move before black would protect the area. To Black will invariably answer with (or Black at , on the other side). To choose which way to block, the general rule here is to block on the wider side, seeking to maximise the usefulness of the outside strength black is building. ensures that White's corner will not be too small. 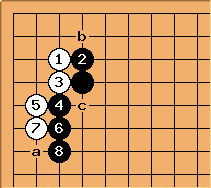 is an important move, preventing white from making progress out into the centre. White plays at to avoid Black playing at the same point. is one usual continuation. Usually crawling along the 2nd line is bad, but is important to prevent Black turning here in sente. White often continues with another crawl at 'a', a play that used to be considered bad. Questions so far? Next, White may play hane at , and the joseki ends with . White has sente and a few points in the corner, but Black's wall is like a block of concrete, controlling a large part of the board. This result is regarded as good for Black locally, but was historically considered White's best choice. AlphaGo and other AIs have generally chosen to avoid the - exchange, and have sometimes played at 'b'. Blacks plays the knights jump to get sente. This can be useful if he has a big framework to defend on the upper side. White gets much more on the left side as compensation, with moves like a or b next. For more discussion see 44Point33InvasionJumpingAway. The usual way to prevent the 3-3 point invasion is an iron pillar at or a depending on where friendly stones are nearby. The one-space jump at b and the diagonal at c can also be used, though they are seen less frequently. This shape is also seen in situations like this, where White has played an approach move, with the same intention of preventing the 3-3 invasion. 'a', 'b', or 'c' are also seen. There is more detail at 4-4 point 3-3 invasion joseki. All about 3-3 point invasion: This is an index page. What if is played as double hane at ? 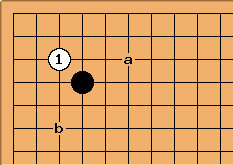 The double hane is played if Black wants to keep the corner territory. See 4-4 point 3-3 invasion double hane. What if is played as hane again at a? This hane is an overplay, Black leaves many cutting points and will be in trouble soon. For more see RTGProblem31. What if is instead played at ‘c’? How do you protect ? Without extra support, this cut would be an overplay. The simplest way for black is to extend at 6 and there could be fighting on the outside but the corner is also weak. The strongest move for black is probably to hane in the corner (left of ‘b’), this defends indirectly by taking white's liberties which means he is unable to capture by atari towards the edge. It also reduces the eyespace of the corner group, so white will probably need to live by atari at 5 and crawling on the 2nd line, which means the cutting stone on the outside suffers and loses power and black might not even bother to capture it if it is cutting 2 now strong groups. What if is instead played at 'c'? Can Black do better than try to capture that stone in a ladder? Two ideas below (a and b). They seem better to me than depending on a ladder, but neither captures the stone directly, if that was what you wanted. c might also work. Can White change the order of play here? What about the cut at a? White can not cut at a, see squeeze tesuji in joseki for how to defend. What can Black do in the corner later? See hovercraft for Black attacks on the corner and the proper defenses. See extensive discussion on discussion page, http://senseis.xmp.net/?topic=2333. black kikashi -- wrong timing? I can't find a tesuji for white to continue? can not be caught in a ladder because of the ladder breaker . Is there a tesuji for white or have white just picked a bad fuseki? Andy: I wouldn't worry too much about as white. could be considered kikashi, but seems not very effective. White could connect at b of course, or white could extend to either of the a points, and then if black cuts at b, white takes the other a point and now white has two solid groups on the left and top, black is walled into the corner, and the two black stones are too close to white's strength. That is what my intuition tells me: Ignore the cut. In real games, where you finish the fuseki before jumping to joseki, however, especially the white group at c, doesn't seems that solid after all. might be close to white's strength, but it can always run away reducing white's potential to next to nothing. The timings are essential, but I didn't draw out what was going on in the two remaining corners, because I liked to cut it down to the essential question.